I am very excited to announce I will be hosting the Jimmy Lallathin Coaches Show for the 2014-2015 basketball season. Coach Lallathin and I talked about this project briefly back in August. I called my friend Jeff Davis, the Vice President of JW Broadcasting and Program Director for NewsTalk 1160 AM- WCFO. Jeff was unbelievably helpful and accommodating. He told me what I would need and offered to be the home of the broadcast. I immediately called my dear friend Wayne “No Offense” Kitchens and pitched the idea to him. Wayne was on-board as well. Thanks to some savvy work by Kennesaw State Associate SID, Brandon Scardigili, the show became a reality. We then turned to Lauren Katovsky from the Kennesaw State Athletic Department’s marketing office. She got me in contact with Bryant and Ken from O’Charley’s and they were super-excited to be the host location for the show. This is a win-win for WCFO and Kennesaw State, and hopefully O’Charley’s. I am so excited to get the show started! 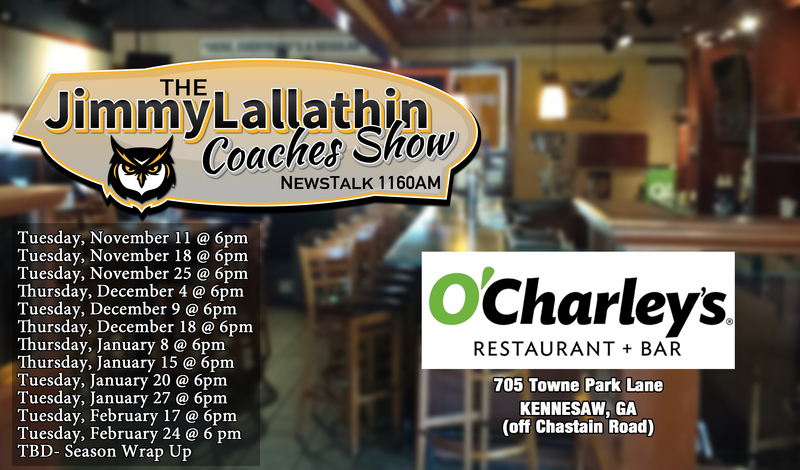 I want this to be a fun atmosphere for everyone, so please check the schedule and come out to watch the show live from O’Charley’s. If you can’t make it out, listen live through ksuowls.com on the night of the show( http://portal.stretchinternet.com/ksu/ ) But, I am also really excited the show will air on a re-broadcast on NewsTalk 1160 the evening after the live taping. A third way to listen is through the TuneIn Radio app, which carries WCFO’s broadcasts. Thanks again to everyone for making this happen! Go Owls! Posted on November 4, 2014, in Uncategorized. Bookmark the permalink. Leave a comment.